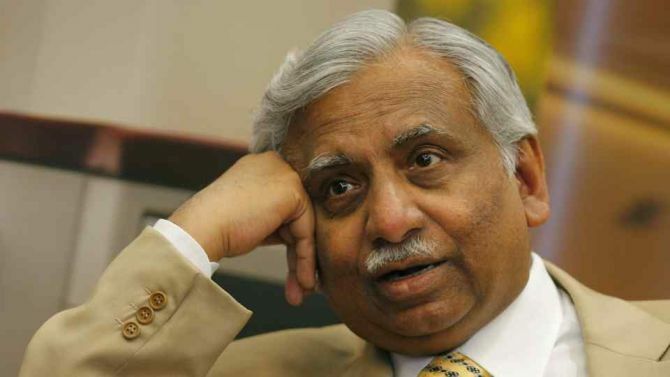 Unless Naresh Goyal pulls the proverbial rabbit out of his hat or reveals an unexpected ace of spades, the airline he built from scratch -- many refer to it as “his baby” -- may slip out of his grasp, says Anjuli Bhargava. You don’t have to look far to see the state of Jet Airways today. The sorry situation of the airline is reflected quite starkly in the quality of the annual report. I vividly remember how thick and glossy the document used to be in the 1990s. It’s now reduced to a slim volume with a rag-like feel. In a nutshell, that’s Jet today. The ground situation is nothing short of a horror story. The airline’s outstanding to employees and vendors -- oil companies, Airports Authority of India, maintenance contractors, lessors and other suppliers -- crossed Rs 12,000 crore, a figure the airline spokesperson denied. Losses have been mounting and the debt on its books, although reduced, is still quite high. The August salary for pilots and engineers came in dribs and drabs and 25 per cent of the September salary came on October 27. The senior management team hasn't been fully paid either, dues are piling up and a handful of executives have quit. Jet Airways has been through several ups and downs in its 25 year history but never have things looked as grim as now. Jet Airways took to the skies in 1993. Promoter Naresh Goyal who rose from nothing and nowhere offered an impeccable service. Jet in fact played a bigger role than anyone in the country envisaged or appreciated: Several corporate deals back then were struck quite literally in the air as the who's who of India rubbed shoulders in Jet's club class. A past master at managing the environment and keeping competition at bay, Goyal was single-handedly credited with preventing Tata group’s entry (ironically, there's talk of him selling to them now) into the Indian air space in 1996 in partnership with Singapore Airlines. He was equally successful at swatting various smaller flies that tried to make a dent in his domain. The airline had an unblemished record till 2003. It was the launch of the erstwhile Air Deccan in 2003-04 followed by the entry of a slew of low-fare airlines in the Indian airspace that was Jet’s undoing. Competition began to chip at Jet's edges and the Indian flying public got its first taste of blood. Fares began to head south and value conscious Indians began to flock to low-fare alternatives. Seeing the writing on the domestic wall, Jet started its first long-haul flight to London in 2005, foraying into international territory, a step that led to further bleeding on its books. But Goyal remained paranoid about competition. Perhaps the biggest nail in Jet's coffin was when Goyal decided to buy out Air Sahara in 2007, a deal his then closest aide Saroj Datta strongly advised him against. Datta -- who is no more -- largely felt that Air Sahara was not worth the money Goyal had agreed to pay and in fact tried his best to dissuade Goyal even at the cost of reneging on his word. Goyal tried to wriggle himself out of it but eventually it was Subroto Roy -- Sahara’s founder -- who had the last laugh. Goyal's paranoia about competition often led him into bizarre situations. I remember watching him smiling beatifically into the camera, arms around arch-rival Vijay Mallya in a golf cart at an aviation event in Hyderabad back in 2007-08. The duo worked on several hare-brained alliances to unite against low-cost carriers. One would have thought Goyal’s fortunes would improve after Kingfisher made its own set of follies and folded up in 2012-13. Unfortunately for him by then the Indian airspace was quite a different animal and was largely out of his grasp. In addition, his past mistakes had caught up with him and the price of those had to be paid. For the last several years, Jet Airways has been trying to restructure with no success. Off and on when the airline would be on the brink of closure, Goyal would tap his rich friends in Mumbai to bail him out. Funds would trickle in fits and starts. In 2013, Goyal managed to sell 24 per cent stake to Etihad for a price of $379 million, which is more than the airline's total market capitalisation today. For the first time in decades, Goyal seems to be in an irretrievable corner. Unless he pulls the proverbial rabbit out of his hat or reveals an unexpected ace of spades, the airline he built from scratch -- many refer to it as “his baby” -- may slip out of his grasp. Those close to Goyal from the start are convinced that Jet can manage without him, but they aren’t sure it’s vice versa.